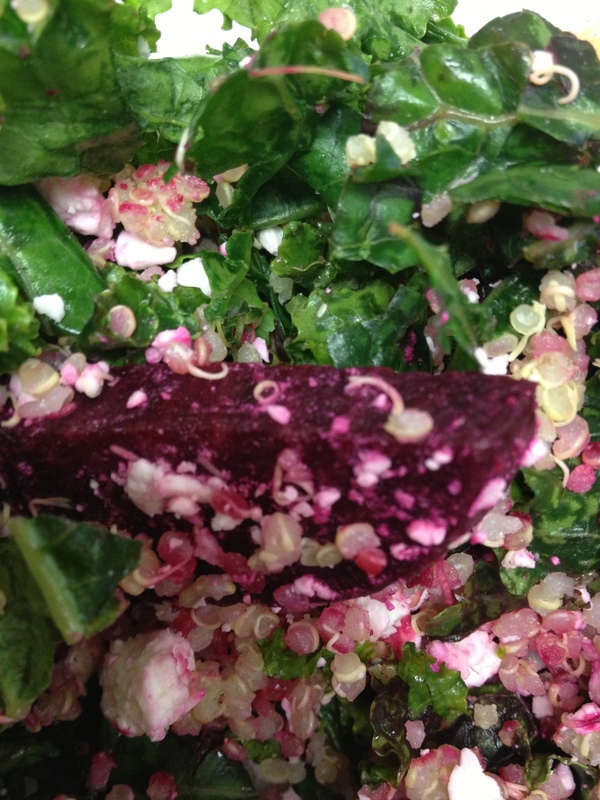 Kale & Beet Salad – simply life.food.fitness. Sometimes (most of the time), I’m a bad grocery shopper. I love grocery shopping so much, I’ll actually “window shop” at the grocery store! Anyway, the other day I was on my way home from visiting my grandma and found myself at Whole Foods (aka my favourite store). It was actually time to stock up for the week, but I found myself unprepared, as in, I had no idea what I wanted to be eating for lunches this week, never mind breakfast and dinner! As I stared, bright-eyed, at the produce, I thought: “BEETS! Oooh, and KALE!” Ok, I had a path… “Oh, and goat feta!” Done! *I learned how to strip kale from its icky (and wonderful, life-giving) stalk this weekend: hold the stem in one hand and the base of the green leaves with the other hand, pull the hand holding the green leaves away from the hand holding the stalk and voila! let there be stalk-less kale leaves! Once my kale was stripped, I chopped it up and put it into a bowl. Instead of massaging each piece (like I’ve done for kale chips), I grabbed handfuls and squished it (like balling dough). I roasted my beets (with their skins and stems) in a 450 degree oven, covered, for about 1 hour, rotating every 15 minutes or so or until I could poke them with a chopstick. After letting the beets cool, I peeled the skins off and chopped them up. I made quinoa (with avocado, cucumber and Spike, wrapped in nori sheets) for dinner so it was an afterthought addition to the salad. I mixed the kale and beets with a little lemon juice then added some quinoa, apple cider vinegar, and the goat feta in the morning; shake-shake-shake and yum!